Welcome back to another edition of Tuesdays With Lazebeak! We’ve officially endured the April snowstorm here in Minnesota and the snow is once again almost outta here, which means it’s time to set our sites on SUMMERTIME!!! 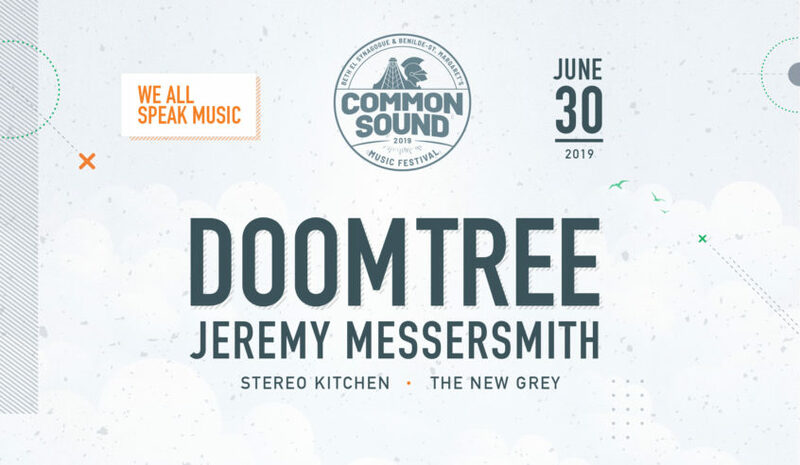 With that being said, it brings me great joy to announce a brand new full-crew Doomtree headlining performance at Common Sound Festival in St. Louis Park, MN on June 30th. SO PUMPED! This will be the only crew performance of the summer, and on top of that we’re going to be joined by our dear friend Jeremy Messersmith on main support. Tickets just officially went on sale yesterday and you can grab yours at a discounted early bird rate right HERE. See you there! Last week I premiered the crazy music video for my Luther single “Valley Low,” which involves me running on a tread mill in short shorts AND embodying the soul of a giant dancing spider at the SAME. DAMN. TIME. Enormous shouts to director Mercies May for all his hard work on this one. Check it out below if you missed it last week and please help me get the word out by sharing it with your peoples. Much appreciated! Here’s a little behind-the-scenes glimpse into the groundbreaking choreography that went into that spider routine. Shouts to Pixel Farm for letting us shoot in their crazy green screen room. Behind the scenes glimpse into the groundbreaking choreography of my new “Valley Low” music video. Directed by @merciesmay. Music video link in bio. Luther has now officially been out in the world for two whole months and the reviews are starting to pour in. None are more important to me though than the sophisticated opinions of my three idiot children. Here’s Penelope Mader with a review that is sure to get her TV time cut in half this week. Official #YoungNelpz Review of #LUTHER. Two thumbs sideways??!!! And a #ButtCheekBeak insult? Unbelievable. Link in bio where you can purchase the album and my daughter for a limited time only. And here’s Cameron Mader with a review that earned him an extra piece of candy after dinner last night. Official #CrabManCam Review of my new solo album #LUTHER. 10 thumbs up but also kind of on the fence. I’ll take it. Album link in bio. And let’s not forget the moment my kids revealed that they have never seen a CD before in their entire lives. Unbelievable. For real though, I’d just like to say thank you for all the kind words and support I’ve been receiving around this Luther project. It’s been a really special year for me already, and the ability to get this music out in the world and have a platform to talk more about mental health and taking better care of ourselves has meant a great deal to me. If you still haven’t heard Luther you can check it out on all platforms right HERE. A few weeks back I had my good friend Mark Mallman on the podcast to talk about his recent book The Happyness Playlist. It was a really eye-opening conversation and Mark ended with a very profound meditation on daily encouragement and fighting through the difficult times. Shouts to Jeyca for putting this little clip together so that I can listen to it over and over again whenever I’m feeling down in the dumps. Thank you, Mark! Some of the realest talk I’ve ever heard. Thanks to @jeyca97 for making this so I can listen to it as my morning motivation til the day I die. And thanks again to @markmallman for being on the latest episode of the Tuesdays With Lazerbeak podcast. Full interview in bio. Have a great weekend! That’s just one of the truth nuggets that Mark dropped on the podcast. If you missed it you can check out the full interview (as well as the first three episodes) on the Soundcloud player below, or from any of your favorite podcast streaming platforms right HERE. A week ago Minneapolis hosted the 2019 Final Four and it was a truly insane weekend. On top of Shredders performing a pop-up tailgate set from a Red Bull army vehicle, I also got to provide some music at this crazy Land O’Lakes-sponsored basketball robot shootout. Yes, you read that correctly. #BotShot consisted of four university robotics teams pitting their basketball robots against against one another in an epic game of H-O-R-S-E. David Robinson and Christian Laettner were there. And now I have proof that the whole thing actually happened in real life. Check this out! Here’s a quick picture of Big Cats! and me and David “The Admiral” Robinson just in case you still don’t believe me. 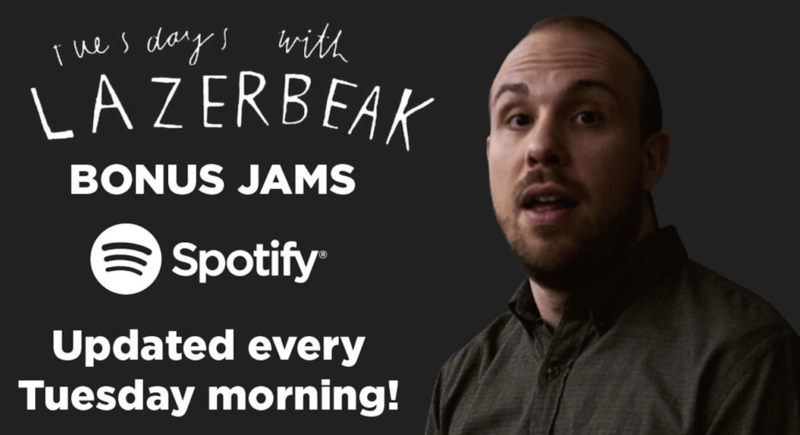 Ok that’ll do it for the Doomtree-related news this week, which means we’re free to dive into another round of Tuesdays With Lazerbeak Bonus Jams! There’s been so much great new music coming out now that Spring is starting to heat up. Let’s kick things off with this new single from Holy Ghost! who are making a triumphant return to the dance world next month with their first album in years. “Escape From Los Angeles” is my favorite song so far from all the previous teasers. Can’t wait to hear the whole thing! Been playing this new Mark Ronson and Lykke Li collabo non-stop the past week. To be honest, I haven’t listened to Lykke Li since that breakout record a decade or so ago, but this song is an absolute smash hit. Perfect summer vibes. KAYTRANADA is back with a new banger and he brought the excellent duo VanJess along for the ride. Kinda hope these guys make a whole record together. Perfect combo. I’m super feeling this new 3-song drop from Kevin Abstract. Supposedly this is the first of four EPs that will make up his next album. If they’re anything like this, I’m all ears. BROCKHAMPTON has never quite clicked for me, I think maybe because it’s so many cooks that I just end up confused, but these songs are crushing it. Tierra Whack just added to her untouchable status by dropping this incredible video for new single “Unemployed.” Video of the year? Super excited about this new Baby Swag EP from Milwaukee rapper/producer Zed Kenzo. Got the chance to kick it with her in Winnipeg at the Midwest Music Exchange and her performance was legendary. Highly recommend checking out the whole EP. Her beats BANG. Shouts to my guy Dave Rene for putting me up on Ama Lou. Loving this new DDD project and she just released a whole visual EP for it as well. Check it out below. Oh man, I’m such a sucker for this new Alejandro Sanz and Camila Cabello duet. WE NEED TO GET BABYFACE ON THE REMIX. Please help. Now for some hometown jams straight out of Minnesota. Dua Saleh continues to take over with this new music video for “Warm Pants” from her excellent new EP. Shouts to Psymun on the production as well. Stophouse’s Cashinova just dropped a great new album called Big Dragon, and he linked up with PROF on this “Skyscrapers” banger. Love this video. I also got to see Lady Lark perform while I was up in Winnipeg and she put on an awesome performance. Really feeling this new “Bad Thoughts” single. Kara Laudon is back with another great single from her upcoming full-length. Check “In My Bones” below. I’m a huge fan of the most recent David Huckfelt album. Here’s a new music video for “False True Lover Blues” which features some beautiful watercolor paintings by Susan Solomon. And lastly here’s a new song from Frankie Lee who will be dropping his Stillwater album later this spring. Check out “Downtown Lights” below and get amped. BAM! That’s it for Bonus Jams. As always, you can add my Bonus Jams Spotify Playlist to your own personal playlists right HERE and take these new songs with you everywhere. I update them every Tuesdays morning with the latest heaters. Just got to 500 songs! Alright, that’s it for this post. I hope you all have a truly wonderful week soaking in the sun rays. I’ll see you back here next Tuesday for another round of TWL!